AerialEyes agricultural drones use specialized optical sensors to collect critical data unseen to the naked eye, allowing growers to "see" plant health and nutrient loading. Integrating agricultural drones with the cutting-edge digital image analysis, AerialEyes provides clients with a new tool for managing agricultural property. A side-by-side comparison of conventional RGB imagery and NDVI map. 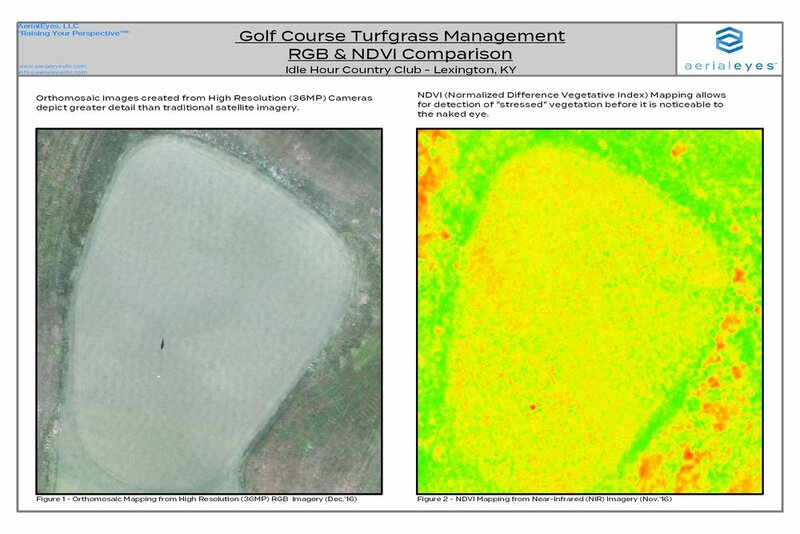 Drone imagery can be used to analyze turf and other vegetation for important factors such as Percent Cover and Dark Green Color Index (DGCI). AerialEyes collects GPS coordinates for irrigation infrastructure, with our digital imaging and spectral analysis methods to provide clients with a comprehensive picture of large irrigated areas. The results and data are stored in Geographic Information Systems (GIS) databases for ease in managing and tracking.